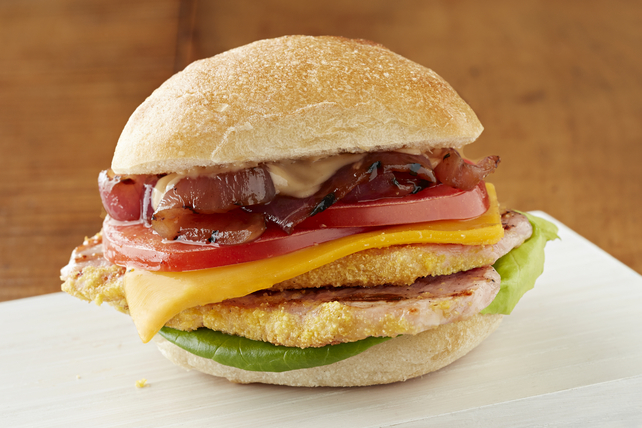 Grilled peameal bacon is the perfect addition to this flavourful sandwich recipe. Grilled onions, gooey cheese and sliced tomatoes team up to make our grilled sandwich recipe extra special. Place greased grill pan on barbecue grate. Heat barbecue to medium-high heat. Meanwhile, place onions in microwaveable bowl; cover with waxed paper. Microwave on HIGH 10 min., stirring after 5 min. ; drain, reserving onions in bowl. Add 2 Tbsp. barbecue sauce to onions; mix well. Microwave, uncovered, 6 to 8 min. or until onions are softened. Spread onions onto hot grill pan; grill 10 to 12 min. or until golden brown, stirring occasionally. Remove grill pan from barbecue; set aside. Spray both sides of bacon slices with cooking spray; grill 2 min. on each side or until done. Mix Miracle Whip and remaining barbecue sauce until blended. Fill buns with lettuce, bacon, process cheese product slices, tomatoes, onions and Miracle Whip mixture. Sometimes called Canadian bacon or back bacon, peameal bacon is made with lean loin cuts, as opposed to the pork belly. Brined, not smoked, it is also typically coated with cornmeal. Prepare these peameal sandwiches using whole wheat hamburger buns or Kaiser buns.